Alton is a city on the Mississippi River in Madison County, Illinois, United States, about 15 miles (24 km) north of St. Louis, Missouri. The population was 27,865 at the 2010 census. It is a part of the Metro-East region of the Greater St. Louis metropolitan area. It is famous for its limestone bluffs along the river north of the city, for its role preceding and during the American Civil War, and as the hometown of jazz musician Miles Davis and Robert Wadlow, the tallest known person in history. It was the site of the last Abraham Lincoln and Stephen Douglas debate in October 1858. The former state penitentiary here was used during the war to hold up to 12,000 Confederate prisoners of war. Although Alton once was growing faster than its sister city of St. Louis, a coalition of St. Louis businessmen planned to build a competing town to stop its expansion and bring business to St. Louis. The result was Grafton, Illinois. Many blocks of housing in Alton were built in the Victorian Queen Anne style; they represent a prosperous period in the river city's history. At the top of the hill in the commercial area, several stone churches and a fine city hall also represent the city's wealth during its good times based on river traffic and shipping. It was a commercial center for a large agricultural area. Numerous residences on hills have sweeping views of the Mississippi River. The Alton area was home to Native Americans for thousands of years before the 19th-century founding by European Americans of the modern city. Historic accounts indicate occupation of this area by the Illiniwek or Illinois Confederacy at the time of European contact. Earlier native settlement is demonstrated by archaeological artifacts and the famous prehistoric Piasa bird painted on a cliff face nearby. The image was first written about in 1673 by French missionary priest Father Jacques Marquette. Alton was developed as a river town in 1818 by Rufus Easton, who named it after his son. Easton ran a passenger ferry service across the Mississippi River to the Missouri shore. Alton is located amid the confluence of three significant navigable rivers: the Illinois, the Mississippi, and the Missouri. Alton grew into a river trading town with an industrial character. The city rises steeply from the waterfront, where massive concrete grain silos and railroad tracks were constructed in the 19th and 20th centuries to aid in shipping the area's grains and produce. Brick commercial buildings are located throughout downtown. Once the site of several brick factories, Alton has an unusually high number of streets still paved in brick. The lower levels of Alton are subject to floods, many of which have inundated the historic downtown area. The flood levels of different dates are marked on the large grain silos, part of the Ardent Mills, near the Argosy Casino at the waterfront. The flood of '93 is the worst in the last 100 years. It became an important town for abolitionists, as Illinois was a free state across from the slave state of Missouri. Pro-slavery activists also lived there and slave catchers often raided the city. Escaped slaves would cross the Mississippi to seek shelter in Alton, and proceed to safer places through stations of the Underground Railroad. During the years before the American Civil War, several homes were equipped with tunnels and hiding places for stations on the Underground Railroad to aid slaves escaping to the North. On November 7, 1837, the abolitionist printer Reverend Elijah P. Lovejoy was murdered by a pro-slavery mob while he tried to protect his Alton-based press from being destroyed for the third time. He had moved from St. Louis because of opposition there. He had printed many abolitionist tracts and distributed them throughout the area. When one of the mob made a move to set the old warehouse on fire, Lovejoy, armed with only a pistol, went outside to try to stop him. The pro-slavery man shot him dead (with a shotgun, five rounds through the midsection); the mob stormed the warehouse and threw Lovejoy's printing press into the Mississippi. Lovejoy thus became the first martyr of the abolition movement. Alton became the seat of a diocese of the Catholic Church in 1857. Its first bishop was French-born Henry Damian Juncker. The new diocese had 58 churches, 18 priests and 50,000 Catholics. When he died, 11 years later, the churches were 125, the priests more than 100, and the Catholics 80,000. He was succeeded by Peter Joseph Baltes from Germany (1869–1886) and James Ryan (1888–1923). In 1923 the bishop's seat was moved to Springfield, Illinois. The Diocese of Alton, no longer a residential bishopric, is today listed by the Catholic Church as a titular see. Titular bishops appointed to the see have been John Clayton Nienstedt and Josu Iriondo. Congressional representatives came to Alton when they drafted the Thirteenth Amendment of the Constitution, to permanently end slavery throughout the Union. Alton resident and US Senator Lyman Trumbull, chairman of the Senate Judiciary Committee, co-wrote the Thirteenth Amendment. 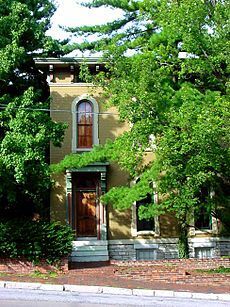 His Alton home, the Lyman Trumbull House, is a National Historic Monument. On October 15, 1858, Alton was the site of the seventh Lincoln-Douglas debate. A memorial at the site in downtown Alton features oversized statues of Lincoln and Douglas, as they would have appeared during the debate. Just 2 weeks into the American Civil War, Alton played an important part in the infamous Camp Jackson Affair, which in large part led to the eviction of Missouri Governor Claiborne Fox Jackson from office. The State of Missouri's nominal neutrality was tested in a conflict over the St. Louis Arsenal. The Federal Government reinforced the Arsenal's tiny garrison with several detachments, most notably a force from the 2nd Infantry under Captain Nathaniel Lyon. Concerned by widespread reports that Governor Jackson intended to use the Missouri Volunteer Militia to attack the Arsenal (and capture its 39,000 small arms), Secretary of War Simon Cameron ordered Lyon (by that time in acting command) to evacuate the majority of the munitions to Illinois. 21,000 guns were secretly evacuated to Alton, IL on the evening of April 29, 1861. The first penitentiary in Illinois was built in Alton. While only a corner of it remains within a few blocks of the river, it once extended nearly to "Church Hill". During the American Civil War, Union forces used it to hold prisoners of war, and some 12,000 Confederates were held there. During the smallpox epidemic of 1863-1864, an estimated 1500-2200 men died. A Confederate mass grave on the north side of Alton holds many of the dead from the epidemic and a memorial marks the site. Often when Confederate prisoners escaped, they tried to cross the Mississippi River back to the slave state of Missouri. Robert Pershing Wadlow, listed in the Guinness Book of Records as the world's tallest documented man at 8 feet 11.1 inches tall, 2,72 m, is buried in Oakwood Cemetery in the area known as Upper Alton. The earth over his grave was raised so visitors can compare its length to other graves. A memorial to him, including a life-sized statue and a replica of his chair, stands on College Avenue, across from the Southern Illinois University Dental School. The Sisters of St Francis of the Martyr St George have their American province motherhouse in Alton. In 1937 two commercial fishermen from Alton caught a bull shark in the Mississippi River. Late that summer they had realized something was troubling their wood and mesh traps. Concluding that it was a fish, they built a strong wire trap and baited it with chicken guts. The next morning, they caught the 5-foot 84-pound shark, which they displayed in the Calhoun Fish Market, where it attracted crowds for days. In 1954, the city of Alton was named as one of the three finalists for the location of the new United States Air Force Academy. Alton lost to the winning site of Colorado Springs, Colorado. 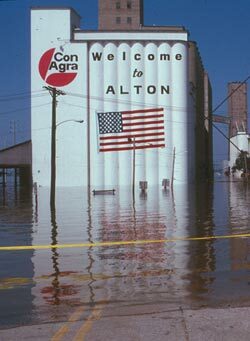 Because of Alton's location at the Mississippi River, the Great Flood of 1993 with its high water level caused severe damage to the city. Alton's water supply was cut off due to flooding, and townspeople had to be supplied with bottled water for more than three weeks. Many local businesses, including Anheuser-Busch of St. Louis, donated funds to help the people of Alton. The original bridge connecting Alton with West Alton, Missouri, was a two-lane (one in each direction) bridge that had become a hazard for motorists and a hindrance for emergency vehicles. The northernmost bridge in the St. Louis metropolitan area, it was torn down in the 1990s. The current Clark Bridge, with two lanes of divided traffic in each direction, plus two bike lanes, opened in 1994. Work had proceeded during the Great Flood of 1993. The award-winning cable-stayed design was done by Hanson Engineers of Springfield, Illinois. Pieces of cables identical to those of the bridge were handed out in educational settings all over the city to allow the city's children to "take home a piece of the bridge". The complex work of construction of the bridge, in which engineers had to deal with the strong river current, barge traffic and the 1993 flood, was featured in the documentary Super Bridge on Nova. Alton is located at (38.900438, -90.159844). This is on the Mississippi River above the mouth of the Missouri River. Most of Alton is located on bluffs overlooking the river valley. The Meeting of the Great Rivers National Scenic Byway runs along the Alton riverfront. A monument and observatory tower, Confluence Tower, located next to the confluence of the Missouri and Mississippi Rivers in neighboring Hartford, IL, has been constructed to provide an overview of the Great Rivers area. This point also marks the beginning of the famous Lewis and Clark Expedition. Also on the river at Alton is Lock and Dam 26, the newest and busiest lock and dam complex on the main channel of the Mississippi River. Adjacent to it on the Illinois side is the National Great Rivers Museum, which features tours of the dam itself several times per day. On the Missouri side is the Audubon Center at Riverlands, which is one of the best places in the world to view birds, as it lies near where the Mississippi Flyway merges the flight paths of the Mississippi, Illinois and Missouri rivers. Also adjacent to the Audubon Center is the Jones-Confluence Point State Park, where you can stand at the confluence of the Missouri and Mississippi Rivers. According to the 2010 census, Alton has a total area of 16.736 square miles (43.35 km2), of which 15.47 square miles (40.07 km2) (or 92.44%) is land and 1.266 square miles (3.28 km2) (or 7.56%) is water. The National Great Rivers Museum is located at the new Lock and Dam No. 26, or Melvin Price Locks and Dam. The lock and dam are open for tours. The lock is a favorite spot to watch bald eagles, which feed on fish coming up in waters below the dam. A large bird sanctuary is located in an area of floodplain and wetlands on the west side of the river. The Great River Road in Illinois north of Alton, looking south. The River Road goes right next to the river north to Grafton. Above that it is often routed inland of the floodplain. It provides views of the dramatic contrast between the high cliffs of the Illinois side to the broad, flat, green agricultural countryside of Portage des Sioux, Missouri. The Great River Road is a popular bicycle touring route. Hidden in a notch of the cliff is the tiny town of Elsah, Illinois, once a down-and-dirty, liquor-soaked tugboaters' retreat, now with renovated properties and antique shops in historic houses. As of the census of 2000, there were 30,496 people, 12,518 households, and 7,648 families residing in the city. The population density was 1,949.3 people per square mile (752.8/km²). There were 13,894 housing units at an average density of 888.1 per square mile (343.0/km²). The racial makeup of the city was 72.32% White, 24.72% African American, 0.18% Native American, 0.38% Asian, 0.01% Pacific Islander, 0.68% from other races, and 1.71% from two or more races. Hispanic or Latino of any race were 1.49% of the population. There were 12,518 households out of which 29.3% had children under the age of 18 living with them, 39.3% were married couples living together, 17.4% had a female householder with no husband present, and 38.9% were non-families. 33.3% of all households were made up of individuals and 13.8% had someone living alone who was 65 years of age or older. The average household size was 2.36 and the average family size was 3.02. In the city, the population was spread out with 25.8% under the age of 18, 9.1% from 18 to 24, 29.1% from 25 to 44, 20.0% from 45 to 64, and 16.0% who were 65 years of age or older. The median age was 35 years. For every 100 females there were 88.4 males. For every 100 females age 18 and over, there were 83.1 males. The median income for a household in the city was $31,213, and the median income for a family was $37,910. Males had a median income of $33,083 versus $22,485 for females. The per capita income for the city was $16,817. About 14.7% of families and 18.7% of the population were below the poverty line, including 26.8% of those under age 18 and 13.2% of those age 65 or over. Alton is home to the Jacoby Arts Center (JAC) (formerly the Madison County Arts Council), a not-for-profit organization that supports local arts and art education and is partially funded by the Illinois Arts Council. It is located on Broadway between Henry and Ridge Streets in the building that housed the Jacoby Furniture Store for nearly 100 years. The JAC is a regional arts center, serving 17 counties throughout south central Illinois, providing a public art gallery, art classes in a variety of media for adults and children, strong performing arts programming including a monthly live music performance, and an outlet to the literary arts, through such programs as the "Poetry Out Loud" high school-level competition and support of the Alton Writers Guild. Alton is also home to the Alton Symphony Orchestra (ASO). In 2011, the ASO is in its 66th season, and is considered one of the premier community orchestras in the Midwest. Musicians range from young adults in their teens to senior citizens. It holds four regular season concerts, a stylish pops concert, and a children's concert; the symphony offers performances to entertain and educate diverse sectors of the community. Founded in 1934 as a community theater, the Alton Little Theater continues to produce a full season of dramatic and comedic plays and musicals. Its all-volunteer members bring quality theater productions to Alton in an intimate setting. The Alton high schools all offer theatrical productions throughout the school year as well. Alton Children's Theater, founded in 1958 by Solveig Sullivan, has provided live theater for children through the years. The plays are now held at Lewis and Clark Community College's Hathaway Hall. For many years, the company has performed for up to 10,000 children annually. This all-volunteer membership hires a professional director, who works with the members for the annual week of performances. Alton has one daily newspaper, The Telegraph, formerly the Alton Evening Telegraph. The Telegraph provides coverage of local news, as well as sports and relevant national news. AdVantage News, a free online (daily) and print (weekly) newspaper, focuses on community features and hyper-local news. It is distributed to all residents and is the locally owned newspaper for the Alton area. The radio station, WBGZ 1570 AM, broadcasts a news/talk format. It has served Alton and the surrounding area for decades. Alton boasts one internet-based resource, Riverbender.com. 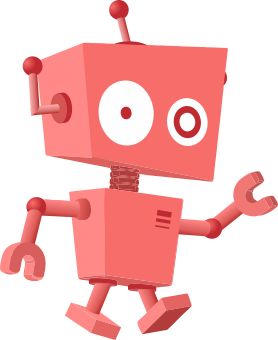 Named for the local bend in the Mississippi River, Riverbender is a portal serving local and national news, classifieds, event calendars and Alton guides to restaurants, shopping and attractions with coupons. In 2007 they were the first company to broadcast the Alton High Schools' sports games live on the website. 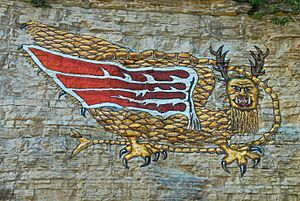 The Piasa Bird painting, reproduction of original on the face of a cliff north-west of the city. 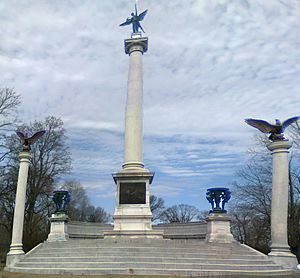 Elijah P. Lovejoy Monument, a 110-foot tall memorial to the famous abolitionist and free speech advocate who was murdered by a pro-slavery mob. The monument is in Alton Cemetery on the bluffs. The Franklin House, later known as the Lincoln Hotel and now the Lincoln Lofts. Lincoln dined here and may have stayed overnight when in Alton for his seventh debate with Stephen Douglas on October 15, 1858. Statues of Lincoln and Douglas mark Lincoln Douglas Square, at the corner of Landmarks and Broadway. This was the site of their last debate before the 1858 Illinois Senatorial Election. The Beall Mansion, designed by notable architect Lucas Pfeiffenberger and built in 1902 and 1903. It has been the private residence of Edmond Beall, four-time mayor of Alton and state senator. St. Peter and Paul Roman Catholic Church; more than 150 years old, it served as the Cathedral of the Diocese of Alton under three bishops (1857 to 1923). In 1923 the cathedral seat of the diocese was moved from Alton to Springfield. A statue of Robert Pershing Wadlow, the tallest fully documented man in the recorded history of the world. Meeting of the Rivers National Scenic Byway, runs through the city adjacent to its beautiful Riverfront Park. Considered by many to be one of the most beautiful drives in the Midwest. Argosy Casino Alton, owned by Penn National Gaming. Alton, Illinois Facts for Kids. Kiddle Encyclopedia.